I have spent lots of time professionally and recreationally around rivers and I cherish every visit. So, I thought that I knew a lot about rivers, but I did not know this. 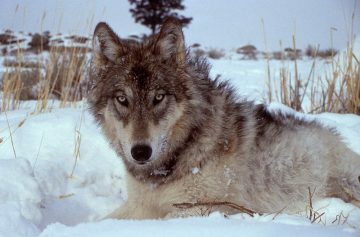 In the 1990s, grey wolves were re-introduced into Yellowstone National Park (in the US) after an absence of about 70 years. Their re-introduction back into the ecosystem has changed the abundance of various prey items (e.g., elk) and plants that sustain those prey items (i.e., via browsing of elk). That is not so surprising. What was unexpected, however, was how the re-introduction of wolves has not only changed the terrestrial landscape (e.g., plant community make-up and abundance), but has also altered the riverscape – the pattern and timing of the flow of rivers in the park. The re-introduction of wolves into Yellowstone (from Canadian stock!) appears to have actually changed the course of rivers in the area. Without giving it all away – this surprising result involves an ecological phenomenon known as a “trophic cascade” and another quintessential Canadian animal – the North American beaver – Castor canadensis. Hard to believe? Click here to view a really interesting video on this unexpected consequence of a trophic cascade in action. You can also read about how the initial loss of grey wolves in the park changed the riverscape by seeing Beschta and Ripple (2006) River channel dynamics following extirpation of wolves in northwestern Yellowstone National Park, USA. Earth Surface Processes and Landforms 31: 1525-1534. A re-introduced grey world in Yellowstone National Park. Written by Rick Taylor, Director of the BBM. Photo at top: River Image, Grizzly River, Yellowstone National Park, via Mota Wallpapers.